The Furuno X-Class Radar maximizes the potential of conventional radar technology and the 12kW DRS12AX maximizes its range potential. Not only will this work horse provide a whopping 96 nautical mile range but it provides exceptional short range detection. All this is packed into a pedestal that is 20% lighter than the previous DRS models and the low noise motor provides quiet operation. Use Bird Mode to find birds in the distance and to get to fertile fishing grounds. Fast Target Tracking is an exclusive Furuno technology that provides target course and speed vectors at the press of a button. It can track 30 targets simultaneously. You can choose between 2 array sizes and both feature a vertical beam width of 22 degrees. The XN12A is a 4’ array with a horizontal beam width 1.9 degrees. And the XN13A is a 6’ array with a horizontal beam width of 1.4 degrees. The lower the horizontal beam width, the better target separation. The antenna can rotate at 24/36/48 rpm range coupled or 24 rpm fixed. The DRS12AX is compatible with the Furuno NavNet TZTouch and TZTouch 2 systems and installation is simple. There is no need for a power supply unit. The pedestal will plug directly to your NavNet TZT system. With the updated smart connector cable there is no need to get inside the gearbox, simply connect the included 15 meter signal cable to the pigtail that is factory installed. The signal cable is terminated with an RJ-45 connector and a power and ground. Plug the RJ-45 into your display or Hub 101 and connect the power and ground to your vessels power and you are ready to go. With the array installed the DRS12AX is 17.5 inches tall and the base requires 10.5” by 11.2” for mounting. The weight of the gearbox is 53 pounds. 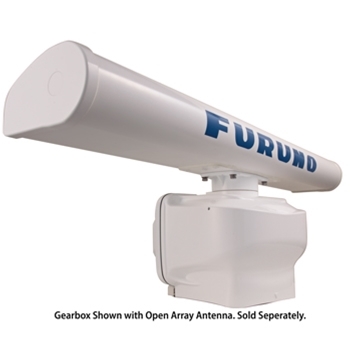 Furuno XN12A/4 is a 4' Open Array Antenna compatible with Furuno's DRS12A Gear Box. Open Array Antenna Only - Gearbox Needed! Furuno XN13A/6 is a 6' Open Array Antenna compatible with Furuno's DRS12A Gear Box. Furuno’s DRS6A-NXT (Next Generation) Radar pedestal combines a Solid-State Radar with pulse compression, Target Analyzer and Fast Target Tracking utilizing Doppler technology and other new features. Open Array Antenna Not Included and Sold Separately. Please Choose Between a 3.5', 4’ or 6’ Option.